It all started with the first youth camp for 127 youth in Bagong Silang, Caloocan City - the biggest slum area in Metro Manila, which eventually expanded into a holistic program covering basic services like shelter, education, health & livelihood. "Sa pamamagitan ng Gawad Kalinga, nagkaroon ng katuparan ang aming pangarap na magkaroon ng disenteng tahanan, makapagtapos ng pag-aaral at maintindihan ang tunay na kahulugan ng salitang pamilya. Namulat ang aming pamilya na tumulong din sa kapwa naming mahihirap upang magsilbing tagapagdaloy ng bawat kwentong inspirasyon at pagbibigay ng pag-asa." 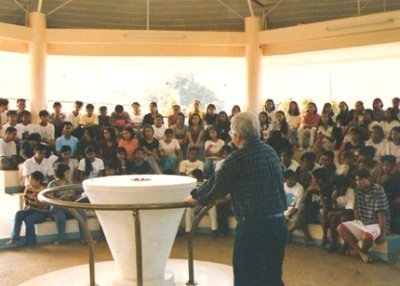 In 2000, eleven teams among Youth for Christ (YFC) pioneered the first GK villages outside of Bagong Silang. In 2002, former President Gloria Arroyo allocated P30 million to build 1,000 GK homes. Resources from government were then matched by local areas and led to massive replication of GK nationwide. 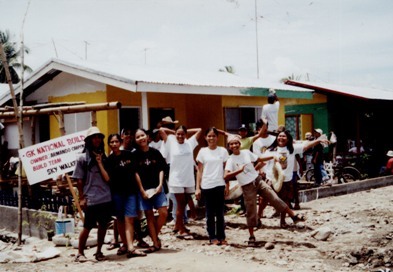 Gawad Kalinga Community Development Foundation, Inc. (GKCDFI) was formally established in 2003. 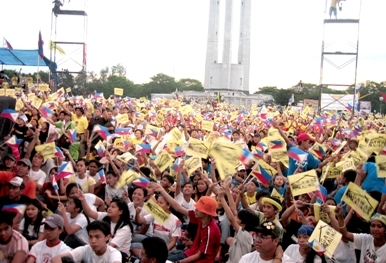 During the first GK Expo (October 4, 2003) in Fort Bonifacio, Taguig City, Former President Corazon Aquino declared that: "GK is People Power," rallying all sectors of society to engage with GK. "By the values it promotes, Gawad Kalinga makes a stand on the kind of life that Filipino communities should strive for - a life of bayanihan, being heroes for one another. GK is people power and people power is GK." 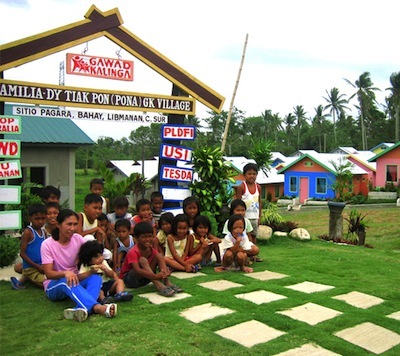 In 2003, the 1st GK Village for indigenous people was built in Capas, Tarlac for the Aetas. This inspired many to start building bridges of hope for the Mangyans of Mindoro, the B'laans of M'lang, the Manobos of Surigao del Sur, the Mamanwas of Surigao del Norte and Surigao del Sur, the Subanens of Zamboanga, and many others. Prominent institutions began to grasp the potential for massive change, including universities like Ateneo de Manila University headed by then-President Fr. Bienvenido F. Nebres, S.J. GK began working with government at the local & national level to help expand GK's reach. GK in Indonesia began with an education program for the youth in Jakarta. Together with the National Disaster Coordinating Council, the Department of Social Welfare and Development and 200 LGUs, GK launched a massive campaign to provide free land and build communities for typhoon victims in Luzon. This pioneered a multi-sectoral template for the rescue and rehabilitation of communities. GK builds peace on ground with the 1st Highway of Peace and the 1st Muslim GK village in Datu Paglas, Maguindanao. 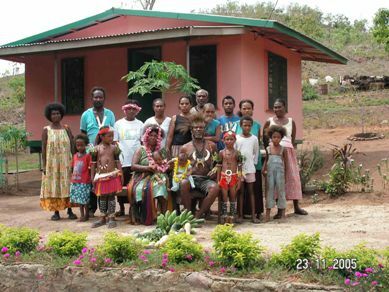 In Papua New Guinea, Gawad Kalinga built Gerehu GK Village, whose residents were previously part of tribal gangs of the city. 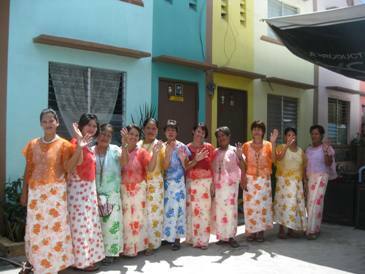 GK Mabuhay was launched to renew Filipino culture on the ground and develop GK communities into tourist destinations. A movement to mainstream volunteerism saw form in the campaign to raise one (1) million volunteers through GK1MB (GK Isang Milyong Bayani). The 1st Bayani Challenge was born from the heroic response of 400 GK volunteers who helped rebuild the lives of the mudslide victims of Ginsaugon, St. Bernard, Southern Leyte. Watch the video of that story here. The GK movement began to receive recognition and acclaim from prestigious groups, including the Community Leadership award from Ramon Magsaysay Foundation (Asia’s Nobel Peace Prize). Tony Meloto also became the 1st Gawad Haydee Yorac awardee. "Gawad Kalinga has thousands of faces. These are faces of every Filipino ethnicity, faith, and social class — of donors at home and abroad who are providing the money and land for new villages; of volunteers across the Philippines who are joining their families, and friends, and schoolmates, and officemates, and fellow church members to build houses and to provide Gawad Kalinga villages with training and services; of executives, lawyers, doctors, architects, and other professionals. 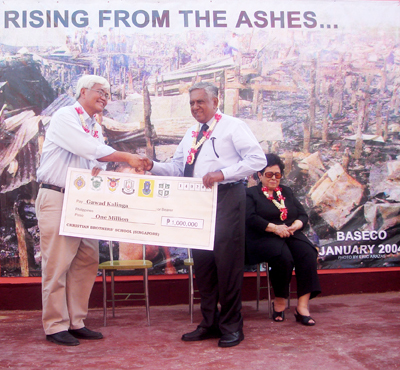 These are also the face of over two hundred thousand grateful beneficiaries." Singaporean President S.R. 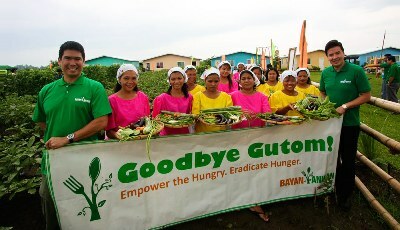 Nathan launched their feeding program on February 14 at GK Baseco, Tondo, Manila. This became a turning point in the growth of the GK movement in Singapore. The GK Rafaella Village built by GK advocate Rose Cabrera, became a sanctuary and haven to 20 families in Phnom Penh, Cambodia. The movie trilogy “Paraiso” hit Metro Manila theaters in 2007 and was premiered in the US, Canada, Europe and Australia. The movie captured the bayanihan spirit of being heroes for one another. Mainstream movie producers, actors, entertainment executives, production people and vendors all waived their fees and did their own share of padugo (bleeding for the cause) in getting this movie made. 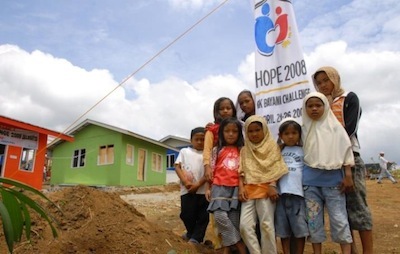 "A NEW RENAISSANCE OF THE FILIPINO"
1,500 volunteers bravely ventured into conflict-ridden areas of Mindanao not just with the goal to give care to poor Muslim families, but with hope to build brotherhood and peace between Christians and Muslims. GK builds hope in Bukidnon (Malaybalay, Kitaotao, Maramag, Dangcagan) and Lanao Del Sur (Wao), showing that the more we sweat for peace, the less we bleed in war. The GK Builders' Institute ushered in students from different fields of expertise to make the GK villages their classroom, bridging the gap between theory and application through internships, training and mentorship. In partnership with the Department of Agriculture, GK launches a new food sufficiency template to end hunger for the poorest of the poor, empowering communities to produce food for their own consumption. Reaching the end of the first phase of its vision, GK launches vision GK2024 through the 1st ever GK Global Summit in Boston on June 12. This 21-year roadmap towards a First World Philippines is unveiled to delegates from US, Canada, Singapore, Malaysia, India, Colombia and the Philippines. 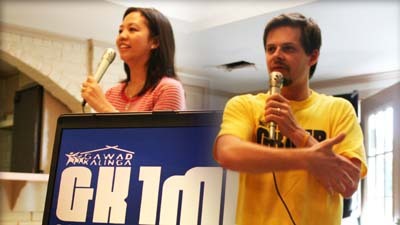 GK sows seeds of peace in Sulu and Zamboanga through the GK Bayani Challenge 2009: Only For The Brave. This captured the boldness of spirit of heroes who built hand in hand with Muslim and Christian brothers in Panglima Estino. Tony Meloto launched the book "Builder of Dreams" chronicling the beginnings of the work and the journey of the first years of the movement. The book was dedicated to Cory and Ninoy Aquino, and was also launched in the United States and Singapore during that same year. Typhoons Ondoy (Ketsana) and Pepeng (Parma) struck and submerged Metro Manila and parts of Northern Luzon. Affected GK sites with zero casualties became command centers for the relief operations of nearby communities. Previous victims of poverty have now become bearers of hope. Uniting the affluent and influential members in the country, Turkish national Beliz Balkir-Cook championed the inaugural Gawad Kalinga Hope Ball on October 8, 2010 at the Manila Peninsula. 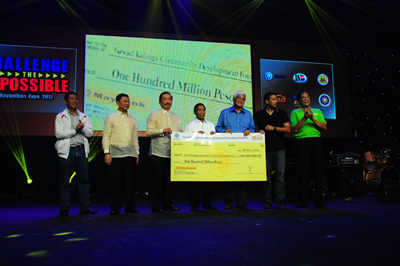 Close to 8 million pesos was raised to be used in building GK communities in Sulu. "We like to open the doors, we like to open the paths, and if we can actually get more people involved, not only with GK, but bring more NGOs to Sulu. If we open the right doors we will lead the way for people and make this a better place." 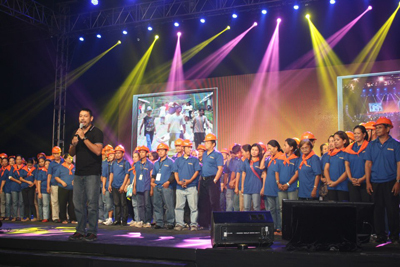 This historic GK Expo ended the first 7 years of Gawad Kalinga. President Benigno Aquino III addressed thousands of volunteers at the QC Memorial Circle, challenging everyone to have the courage to care and expressing the importance of public-private partnerships. "Similar to what GK did, I encourage you to do bayanihan with one another so that we can fix our country. GK has proven this (model works), that is why we are pushing for the relationship of the private sector with government and our people." The Field of Dreams is bayanihan in action among the private sector, government and GK families, raising the dignity of SAGIP kids through sports. In September 2010, the GK Paradise Heights Football Club was instituted, even attracting children and parents who were not originally from GK communities. Cecille David, Rose Cabrera, Pinky Poe, Divine Duran and Marivic Pineda establish GKonomics, the social enterprise development partner of GK that is now building strong, sustainable and scalable social enterprises in GK communities all over the Philippines. "LBF and GK are on a common mission to tackle this greatest scourge of our country — the poverty that blights the lives of so many Filipinos. And we believe that the best approach is through initiatives that are simple and straightforward, focused in purpose, and as sustainable as poverty is persistent." Recognizing the role played by schools as partners of GK, the 1st Schools for Nation Building Conference (SNBC) was organized by the Father Saturnino Urios University of Butuan City, Agusan del Norte and was held in Ateneo de Manila University. GK Canada was launched in October 2010 where Tony Meloto, partners from the Filipino-Canadian community and corporations such as TELUS International, SunLife, Manulife and Canadian Urban Institute were present. 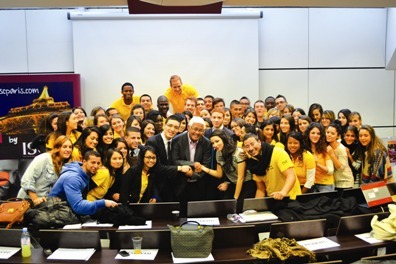 Through the efforts of GK Advocate from France Olivier Girault, GK connected to a new network of students and school officials all over Europe. This paved the way for bigger innovations to be explored in the Philippines, drastically increasing the number interns coming from the best French universities. The Filipino Volunteerism in Nation Building Act of 2010 is the first of a series of bills inspired and spearheaded by GK, paving the way for more players to collaborate in building viable, sustainable and empowered communities in 50,000 barangays all over the country. The launching of the GK Enchanted Farm in Bulacan opens the 2nd stage of Gawad Kalinga's development program (Social Artistry, 2011-2017). As a model for rural economic development, the Enchanted Farm is the first of 25 that will be developed across the country, connecting the poor to the capital, technology, expertise and markets they so need. Among the many other partners that the Farm will attract in the next couple of years, Shell was one of the first to commit, converting the rough roads leading to the Enchanted Farm using Instapave Technology, an all-weather paving system. “Sa pamamagitan ng CSI, nasusuportahan ang mga entrepreneur at nailalapit sa mga komunidad ang negosyo. Nagsisilbing mabuting ehemplo ang gawaing ito tungo sa pagpapaunlad ng bansa (Through CSI, entrepreneurs are provided with support and business is being drawn near to communities. This project serves as a good example toward the progress of the country)." 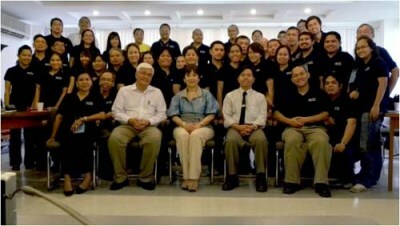 The GK Global Summit was held at the Univ. 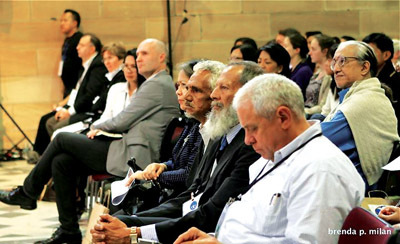 of Sydney and St. Aloysius College, hosted by the Sydney Univ. Law School and the New South Wales Aboriginal Land Council. It focused on how a GK approach might address poverty and marginalization in wealthy countries where pockets of despair exist, especially amongst indigenous and minority peoples. GK becomes the first organization to be accredited with the Board of Investments (BOI) as a conduit for the mass housing compliance required of vertical housing developers. This ensures that in this age of rapid urban development, the poor will not be left behind. 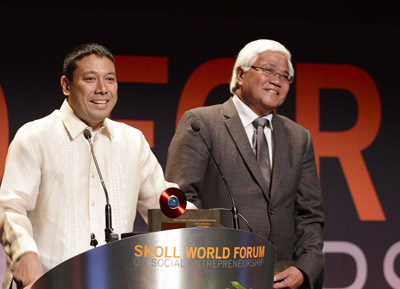 Last March 29, receiving the Skoll Award for Social Entrepreneurship in Oxford, England allowed us to share the incredible journey of ordinary dream-builders from the slums of Manila to a world stage. The funds from the 3-year Skoll grant will be used to build GK's capacity to scale its values-based model through strategic alliances, strengthen the organization to reach 1M poor families, and design and implement an impact assessment framework. Through the Skoll grant and by partnering with Ateneo's Institute of Philippine Culture and GK Ateneo, with the guidance of Former Ateneo President Fr. 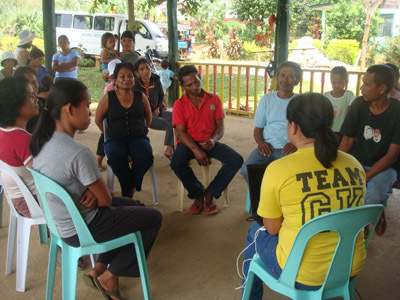 Bienvenido Nebres, S.J., GK embarked on the Community Impact Assessment Study. This will give us empirical data and an understanding on how to further improve our development template to maximize impact in the communities we serve. It will also facilitate faster replication of the GK model towards 2024. 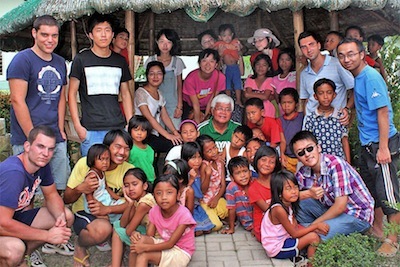 The unprecedented damage brought about by Sendong in Northern Mindanao in end Dec 2011 brought much devastation and heartache, but also the opportunity for Filipinos to come together. GK's multi-sectoral network of caretaker teams and volunteers on the ground hand-in-hand with the local government and strategic partners from the public and private sectors (San Miguel Corporation, Berjaya Philippines, Shell, SM, BDO) allowed us to act immediately. One year after Sendong, around 2,000 families from Iligan and Cagayan de Oro were able to spend Christmas in their new homes. Gawad Kalinga and Pilipinas Natin of the Presidential Communications Operations Office, together with the local government, brought the annual Bayani Challenge to a whole new level by expanding from just building homes in 5 days to caring for 5 different hometowns with more than 10,000 volunteers (PILIPINAS, NGAYON NA! 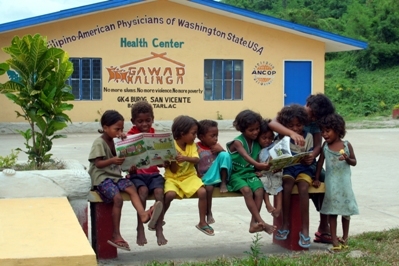 in Iligan, Cagayan de Oro, Masbate, Negros Oriental and Occidental Mindoro). The Bayanihan Expo, organized together with Pilipinas Natin, the Presidential Communications Operations Office (PCOO) and the League of Provinces of the Philippines, marked 9 years of GK's journey. It highlighted the new and emerging face of GK: a force driven by many partners from all over the country and even the world. 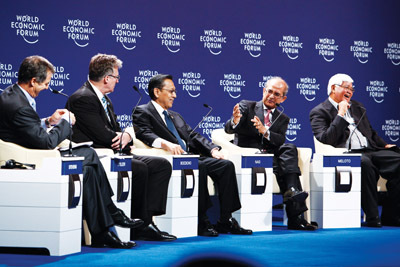 It was during the Expo that the Berjaya Group of Malaysia brought corporate commitment to a whole new level. They pledged to donate a total of P300 million over the next 3 years to build more homes and end poverty on a wider scale. GK Australia trail-blazes in exploring how the GK model of caring and sharing can be applied to the disadvantaged Aboriginal and Torres Strait Islander communities. 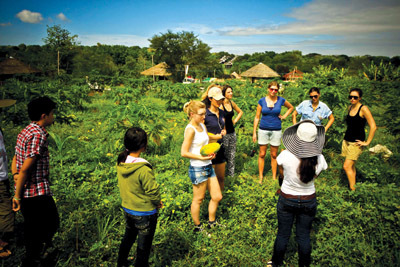 The 1st Social Business Summit at the GK Enchanted Farm is held on October 2-5, 2013, celebrating GK's journey over the last 10 years and highlighting the importance of the next phase of the work. 10 years of Walang Iwanan is celebrated at the 10th Year GK Expo held at the Enchanted Farm on October 5, 2013. Gawad Kalinga Worker's Associaton (GAWA) organizes skilled and non-skilled workers--from construction workers and repairmen to housekeepers and drivers--preparing them for opportunities by building their character and skills. 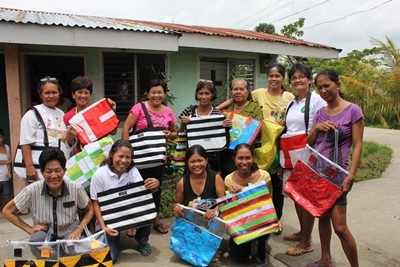 GK, its partners and volunteers respond to Supertyphoon Yolanda (Haiyan) by bringing more than 100,000 relief packs to affected families and starting the reconstruction of 20,000 homes in the next 3 years. GK and Central Mindanao University (CMU) hold the first ever Mindanao Social Business Summit in Maramag, Bukidnon to push for inclusive growth through social enterprise, especially among indigenous and underprivileged communities of Mindanao. 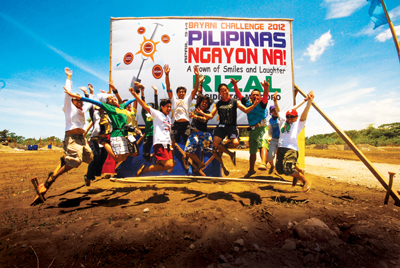 From April 9 to June 12, the Bayani Challenge 2014: WALANG IWANAN is held in the disaster-hit provinces of the Visayas, Palawan, and Zamboanga. a total of 1,751,518 volunteers from all sectors of society come together and show what it means to leave no one behind.